I bet you used to be much happier. It’s no secret that as children, we were probably happy. We didn’t know any better. Nobody taught us any differently. As the media, teachers, fellow humans, and society in general started telling us who and what we should be, we started to become stressed out, depressed, anxiety-ridden, and just plain, well, un-happy. When I set out to write Learning to Be Human Again, one of my objectives was to remind you that we’ve been taught how to act, when to act, and where to act in society. We’ve been taught racism, gender inequality, hatred, and self-deprecating behavior. I also believe that we’ve been taught to be un-happy. Whether it was taught with false expectations, perfectionism, or just plain old low self-esteem. "Achieving a major goal or facing a challenge head-on can be a life-changing experience. Hiking the forty-eight, four-thousand-foot peaks of New Hampshire's White Mountains taught me more than I could ever imagine. Take a walk with me as I climb mountain by mountain, and experience the lessons and takeaways learned from each peak I summited." Now available on kindle or paperback! "Learning to Be Happy Again", "Forward, Upward, Onward", or "LEARNING TO BE HUMAN AGAIN"
"What a delight I found in the journey he shares with us! It's far more than a journey through the 48 although I did some reminiscing of my own hikes while reading. It's a journey of goal setting and moving our life forward, upward and onward." 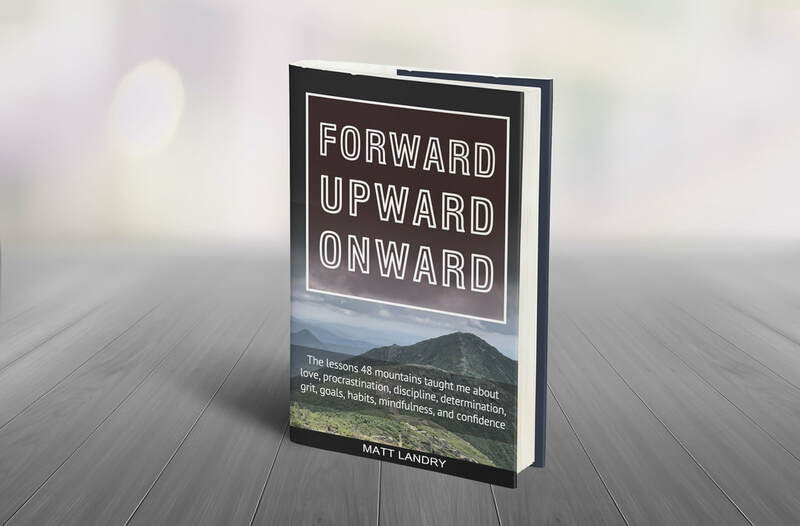 "Following along with Matt's quest as I read, I found myself on several occasions nodding my head with empathy and understanding. What an enjoyable story about an equally enjoyable adventure." "A very warm, uplifting, at times entertaining read that I would definitely recommend if you need a book to make you feel good about life, love and all the other small stuff that accompanies you on the journey." -Scott Allan - Author of "Do It Scared" and "Empower Your Life"
"Learning to Be Human Again"
"The book is full of insight, and a unique wisdom blended with occasional humor the author masterfully articulates his message to the reader audience. I would certainly like to see this made into a series because it is full of themes​ that we can all relate to in order to live as greater human beings. "It's a wonderfully insightful guide to the inner workings of the human condition. Highly articulate and written from the standpoint of someone who truly cares about and empathizes with his fellow man." "I've read a lot of "personal development" type books over the last 5+ years, but what I love about this book is that Matt provides simple, yet specific steps you can take to easily APPLY the insights he shares. And if you do, I guarantee they will have a profound impact on your life." I'm a firm believer in empowering and encouraging the people who surround us. Life can be a confusing and overwhelming place sometimes, but it doesn't always have to be that way. I'm blessed to know that my purpose is to make the lives of others' easier. I know I've also needed the hand of another to walk me through some of this human experience. I guess we all need a little help sometimes, don't you? I like to think of myself as both a teacher, student, and tour guide in life, having experienced it from it's exhilarating highs to it's devastating lows. A lover of nature, and the outdoors, I try to travel extensively, learning as much as I possible can about human nature and the world around me along the way.